You a fan I take it then ? 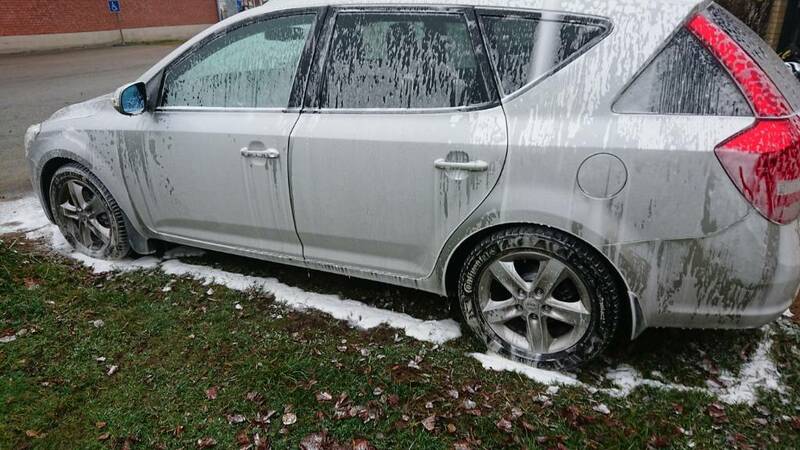 As you see the road salt is building up on the hatch. And the brake dust is a little to much LOL. So get the foamcannon loaded with Bilt Hamber Auto-Foam. You don`t get shaving cream thick foam with it. But it`s manufactured that way so the most dirt runs off. The cleaning ability is awesome from it. And the weather was perfect for it to dwell for a long time before PW it off. No wind and clouds covered the sky. As useally I always start to PW from the bottom and work my way up. This is so the run off when going up don`t get attached again to the dirt that has not been rinsed off. Another benefit is that you see where you have cleaned with the water pressure from the PW. The water pressure is what does the heavy lifting when cleaning. I`m always amazed at how clean it gets after a thorough prewash. But to be honest this time it`s was quite a lot of bonded dirt. That only comes off with a touch wash. The results after the prewash. There where some bug squash left from after the prewash. That also says the wash was long overdue. 3-4 weeks and the prewash foam and PW clean the bug squash away easly. Now I took out a degreaser that is a combo of solvent and alkaline and is a concentrate. Get it in 5l jugs and with the dilution of 1:20 and up to 1:60. It`s gets you a whole lot of degreaser. You can apply it on wet surfaces. At 1:20 dilution you even desolve new tar spots. I have it diluted at 1:40 as it takes care of the bug squash easy. Epoca Pump sprayer and spraying the front and the side mirrors. Let it dwell for 3-5min and PW clean the bug squash off. As you can see the days are getting shorter so the daylight was going away. And when I had to hurry up I didn`t take more pictures as it`s gets darker the mobile phone camera is not takeing the best quality pictures. Wheel cleaning with Sonax Wheel Cleaner Plus and different brushes. 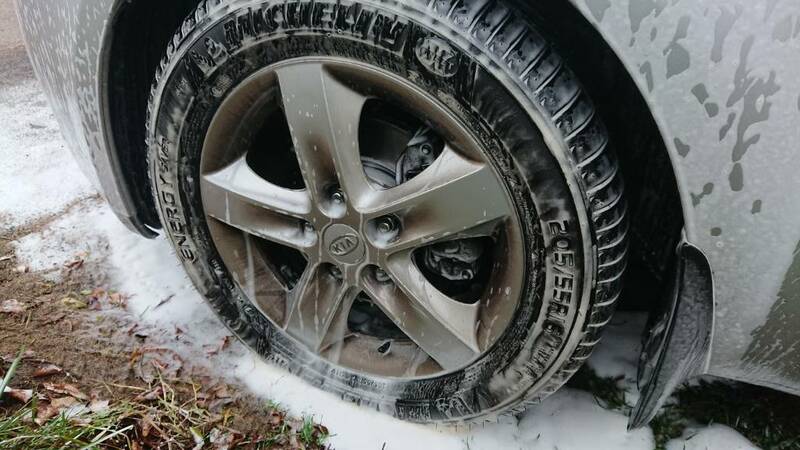 The prewash foam accually cleans the tires very well. So Sonax Wheel Cleaner Plus takes care of the dirt on the tires too. Since it was dew in the air and I wanted some added protection. The choice was to use Angelwax Enigma Ceramic Infused car soap. I`m really impressed how my protection has holding up. I used Herrenfarth Sprühglanz Scandinavia Limeted Edition in may I think. And topped it up with Angelwax Enigma QED the last wash in august. I thought it where done by now. But it`s keeps to hanging in there. It`s not like it was newly applyied. But no areas where totaly done either. The Enigma car soap in the bucket and multible wash pads and wash mitts. Left the protection more hydrophobic and a nice warm gloss. The cleaning ability from this car soap is great. And noticed today that the sheeting properties of it left not much water when drying it. Hope I can be able to polishing and protect it before winter comes in on us. Want so badly to see how the Polish Angel Esclate Lotion and Master Sealant combo is going look on my car. Then I`m thinking if it`s worth it to do. We have a law that says we don`t can have any snow on the vehicals here in Sweden. And that`s where I get the small scratches from when removing the snow. Since it`s sits outside 24/7 there gets an ice layer on the paint and snow above that. It`s not fun to remove that in a safe way. So thinking of just decon and protect it over the winter months. And polishing when the spring is coming. Maybe just polishing the front bumper and the hood and some spots that is scratched up. Or maybe just hide it with Bilt Hamber Auto-balm LOL. Mi Hermano Sueco Tony ! I am sorry to read you have such bad pain. Hope you get better soon.. I do not know if you can get this, but if for some reason you cannot, I will be happy to buy it and see if the company will ship it to you in Sweden.. If they cannot, I will attempt to do this myself.. Let me know, ok ? You did a great job on your vehicle ! We are experiencing similar dark weather also - especially since a couple of huge fires close by have left a massive smoke cloud over the entire area for several days.. I hope you are able to get your vehicle`s all prepared for Winter.. Wish I could help you out.. Finally got to wash the ZR2 and inspect it and put some kind of protection on. Went with hydro blue since it`s quick. 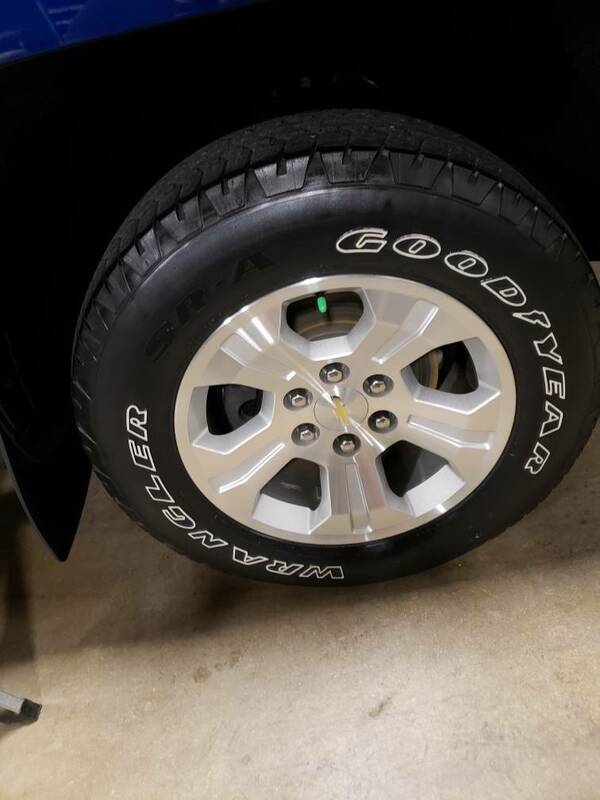 Got rid of most of the dealer tire slime. Had some tonno cover protectant in old stock and used it. Tires got #253. Overall the paint was in good shape. 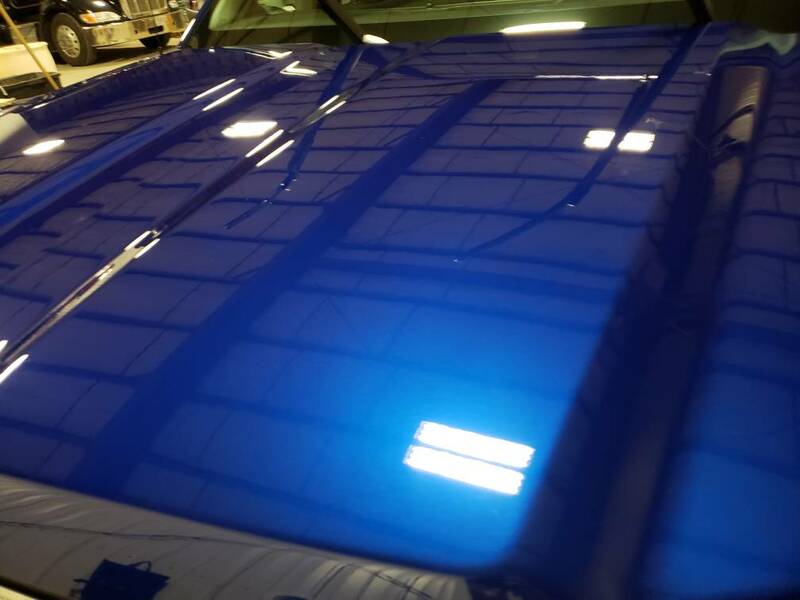 A few chips on the passenger door handle that I will address along with the noted taillight paint blob and hood scoop paint area to the dealer. Passenger taillight had some condensation in it that seemed to clear up, but that`s on the list too. Time to place a order to WEATHERTECH for mud flaps, ventvisors and a bug shield. 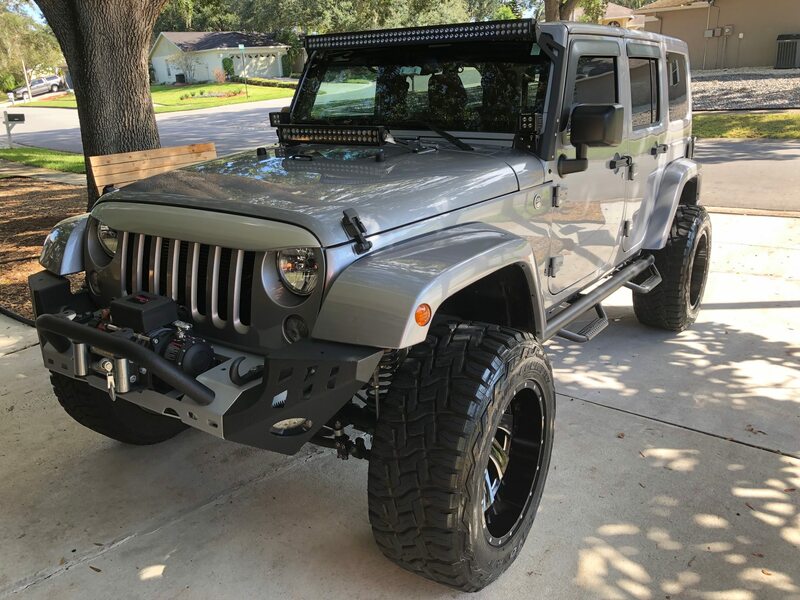 detailed a friend`s 2015 jeep sahara. topped with BF SiO2 sealant. Thanks for the tips about the arnica oil Dan! I have looked it up and if not for me then my mother with fibromyalgi could benefit from it. I have many collapsed disc in the spine. And is born with a to narrowed spinal cord channel. So the disc is pushing in the spinal cord. Which have been the reason to the permanent nerve damage and pain. It`s to many discs to do fusion surgery on. So the pain level treatment is the only thing that the doctors do. But I`m going to try to get another opinion at another spine specialist doctor. And see if they have any different solution for me. The hassle to get to one of those is a pain it self LOL. I have had this problems with the spine for a long time now. It`s over 16 years now since it broke out. And at the age of 26 when it happened the doctors found out to late that it was as severe as it was. Have done 2 surgerys in the lower back and one double fusion surgery in the neck. So try to live with it as good as I can. But have to do something fysical work once and while to not be going nuts LOL. The rised pain level is what I pays for and that`s better than doing nothing. Man those forrest fires is scary! We had some in Sweden this summer. That we needed to get help from other countries to tackle those. One forrest fire was on a traing ground for the air force. All the risk with missiles that had not gone off. They accually tested with great success to bomb the forrest fire on stratigic places to put them out. And know that other countries been shared the experience they got from that testing. Saw that the US also had a big interest in the outcome. The downside is that it`s only works in very certain places and to be certain that no people is near where they bomb the forrest fires. Hope that they can get the control of the forrest fires soon and that mother nature helps out too with a lot of rain. Stay safe Dan and take care of your family! 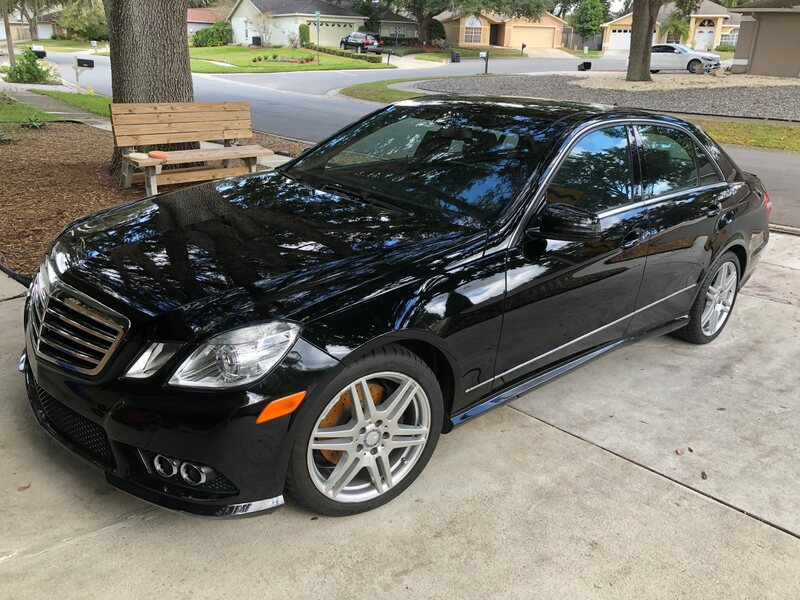 detailed a friend`s 2009 Mercedes E550. topped off with BF SiO2 sealant. 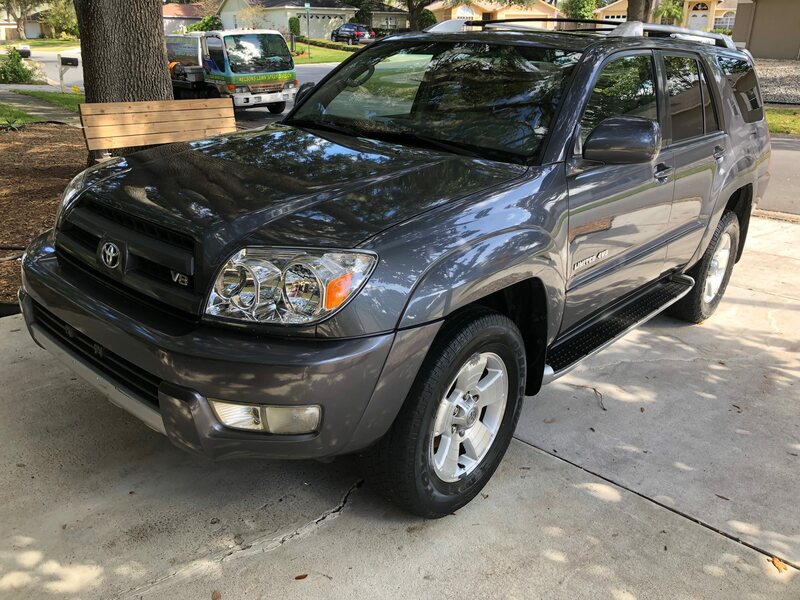 detailed a friend`s 2003 Toyota 4 runner. sits outside 24/7, so i thought i`d try an older intact bottle of menzerna one step acrylic jacket on a lc orange pad. i was surprised it was still good and left a nice finish. You are working on some sweet cars. Truck that I did on Wednesday and Thursday and was picked up today. Customer was a new client referred to my by a friend of his.